I don’t know one person who doesn’t like clam chowder. This delicious, hearty and super filling soup contains chunks of clams that will leave you yearning for more. Although it’s a people’s favorite, making it requires that you follow several steps keenly. Therefore, not many people want to make it at home from scratch. Luckily, there are various canned options that will deliver the restaurant flavor and texture. There are several brands in the market. All of them are unique. But, for you to identify the one that satisfies your taste buds, you must take your time to conduct a research. The following contents are your guide to the best canned clam chowder. This is a soup or stew that contains broth and seafood (clam or sometimes fish). The soup features ingredients like tomatoes, milk, onion, celery, salted pork and other veggies. There are different kinds of chowder with the famous one being the clam. Different regions of the country prepare clam chowder differently. However, the basic one usually contains clams, onions, a form of pork and potatoes. Depending on where you are, the broth may vary. You may use the following varieties. Others love it red in color. This is achieved by using tomatoes and spices. Others love it clear. The clear type is made using clam juice. So, the flavor and texture of the soup may vary depending on where you eat the meal. However, understand that despite their differences the basic ingredient is the clam. Each place believes their clam chowder is the best. The clam chowder originated from the Eastern United States. The famous New England chowder was brought to the region by the British, Scotian and French settlers. History indicates that this happened between the 16th and 17th centuries. The meal continued to gain popularity among the American Catholics who abstained from meat on Fridays. 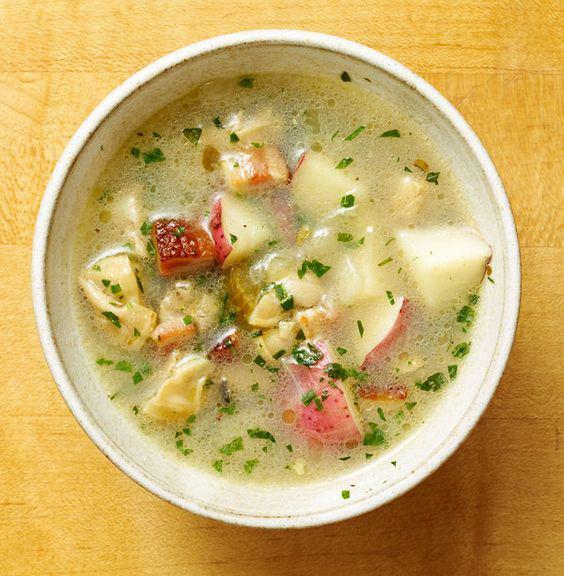 By the 18th century, the soup was a special delicacy in Boston’s Ye Olde Union Oyster House. This is the oldest restaurant in the country. We have different varieties of clam chowder from East & West coast. However, there are 3 major ones as you will discover below. This is a thick design of clam chowder. You make it using potatoes, salted pork, onions and milk/cream. The soup base must be whole milk or heavy cream because what differentiates the New England clam chowder from other varieties is its thick texture and white color. This soup contains no other veggies except potatoes but it uses oyster crackers to thicken most times. 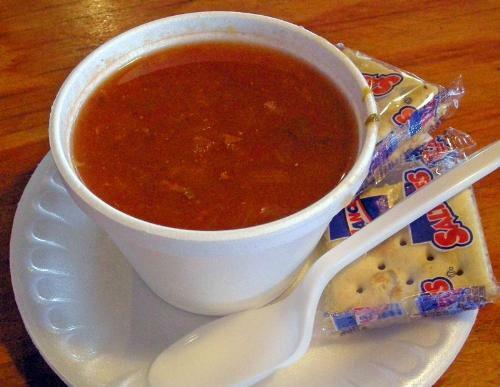 The soup is a classic in Boston’s history yet it’s also popular in Maine and Massachusetts. It has also gained popularity in other parts of the world. This is the clear kind of clam chowder that uses the large-sized clam (quahogs). This soup is also available in red color. However, unlike the common Manhattan chowder that’s made using the red tomatoes, this you make using the tomato puree. There are other additional veggies used for the red version. It’s distinct because of its red color. The color is a result of using the tomatoes and tomato puree. It’s a thinner version than the New England clam chowder. It uses a few potatoes to enhance the texture. Note that. it’s the only version that uses more veggies like celery, garlic, carrots and onions. The Manhattan version is also popular in New York. Initially, the tomato twist of clam chowder wasn’t welcomed. However, today you will find it in all the major cities of the country. This variety is closely related to the Manhattan one. It’s made using creamed asparagus, tomatoes, bacon and light cream. You then season it with old bay spice, celery powder and parsley. This is the signature of Florida state. It again is like the Manhattan because it uses tomatoes. The distinction is that it uses the datil pepper to flavor it. The pepper is responsible for the sweet, tart and spicy flavor of the soup. Its name is about the Florida settlers who were natives of an island in Spain called Minorcan. They are the inventors of this soups and they used the Mediterranean ingredients to make it. What does clam chowder taste like? When it comes to taste, it’s usually about personal preferences. What tastes good to me might not taste good to you. There are factors like how it’s made, the kind you are eating and what really triggers your taste buds that determine the taste. However, I must say that this is so good. We might describe the taste as creamy, ocean, sometimes peppery and chewy because of the clam. So, it’s a blend of all the above with no flavor over-powering the other which makes it comforting. When it comes to a ready to serve chowder soup, nothing beats the Progresso. The soup is made using potatoes and clams for a wholesome meal. It’s your natural option designed for those who are health conscious as it has no additives or colorings. The soup is gluten-free and creamy in flavor. You may find this interesting but the potatoes in this can are left with the peel to make sure you enjoy the whole and richness of the meal. Apart from being gluten-free, it also has no MSG which keeps the sodium at an acceptable level. For me, this is beyond what I would ask for in an instant soup. This is your Manhattan version from the best company. If you like the combination of spicy, warm tomatoes that have the salt flavor of clams then this is your best one. It features a condensed soup that is thinned with water, not milk. You don’t have to worry about GMO’S because the soup is made using farm-grown ingredients. 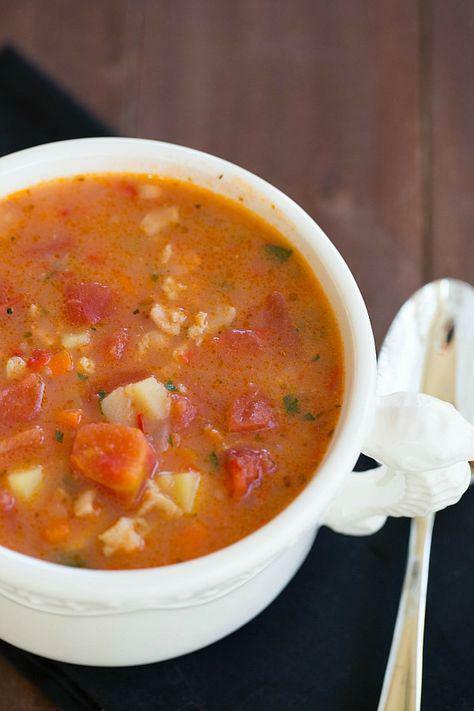 This soup fits all the seafood lovers. It’s a load of deliciously tasty clam broth and a blend of tomatoes, potatoes, carrots, celery and chewy-succulent clams. It’s crucial to note that it’s a healthy combination that is free of cholesterol and low in fat. It further has no artificial flavors. It will serve you as a perfect hybrid when you want to cook at home. The soup uses wheat flour so it may harm those who are gluten-resistant. 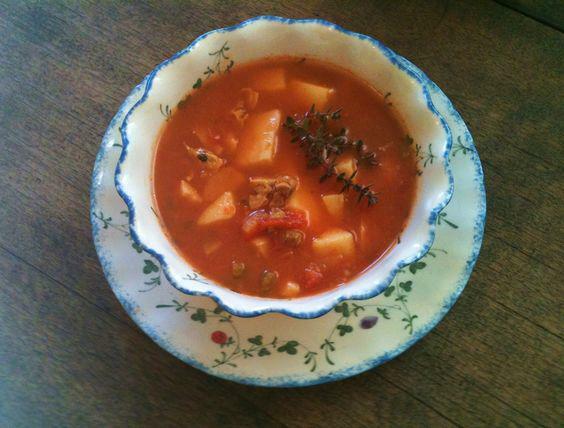 I would say this is among the best Manhattan clam chowder with a whole natural goodness of soup. It’s not a surprise though because the Progresso company produces healthy soups with fewer calories. It will give you only 100 calories per serving. The ready to eat clam chowder has a hearty number of clams that would serve up to two people. The soup is free of MSG, flavoring and coloring making it healthy on the go-to soup. It’s also gluten-free and it takes about 3 minutes to prepare. It only features wholesome and nutritious meals that include carrots, celery, clam and potatoes. You could either warm it on a stove top or your microwave. If you like it cold, no worries as you can eat it straight from the can. This is a combination of both healthy and richly flavored soup that will leave you licking your fingers. If you would love the all-natural taste of seafood then this Manhattan clam will suit your taste buds. The seafood used to make different meals is hand sorted to only choose the best clams from the Gulf of Maine. Since all the meals are prepared in the bar harbor kitchen, the seafood lives you with a dash of the crispness of the offshore winds. Remember, clam chowder has its origin in Maine where the bar harbor is based. Therefore, it’s a mix of the authentic tradition and use of natural foodstuff. This is normally produced in small batches. Just as its simplicity in the packaging so is its simplicity in production. This features the best clam from Maine. 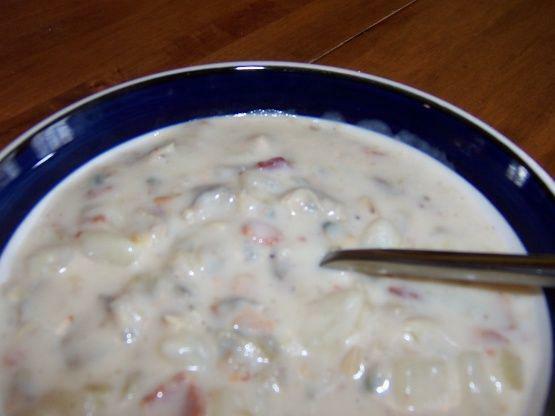 Clam chowder has a history in Maine and its staple food there. The families normally gather around during winter season with a thick and warm bowl of chowder to catch up. The company is located at the Downeast Maine and has existed for years. They have also fine-tuned the recipe to suit different generation taste buds. The New England chowder is sold in its condensed form. Moreover, the chowder like the Bar Harbour Manhattan version has the best clams handpicked from the Gulf of Maine. Also, it utilizes all other natural ingredients for the chowder production. It contains no artificial ingredients or MSG and the soup is filling especially when you accompany it with bread. The foods from bar harbor are top notch and this is no exception. Since it contains no bacon or other meat forms, you may find the taste being bland. Consider adding salt and pepper to enhance the delicious flavor. Everybody knows just how effective soups are during the cold season. Whether you want to take it from a restaurant or make it at home, the clam chowder is your on the go-to soup. What I love about this soup is that the clams you find inside are exceptional in taste and color. 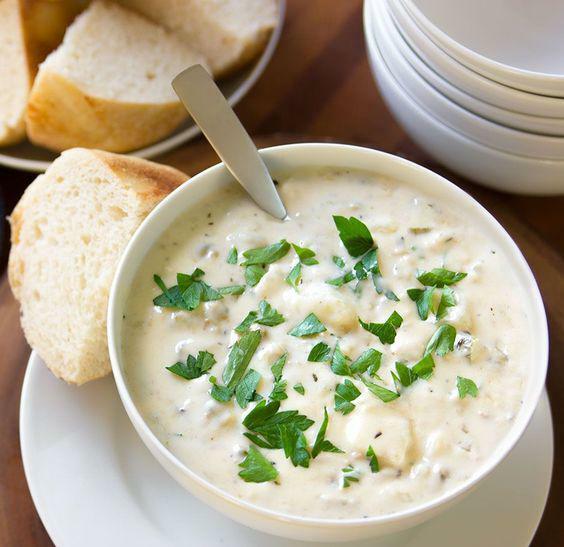 Most clam chowder varieties are loved when they contain large portion of clams because of its chewy texture. 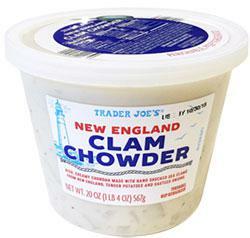 Traders joe’s chowder has a generous serving of clams to increase the chewy texture. If you love the fish flavor then this is to give you satisfaction. To further enhance the flavor, you can add ground pepper then add crackers and you have a flavorful, full meal. The company even has the refrigerating version. It has chunks of potatoes but lacks bacon which makes it a little bland for people who love the bacon flavor in their clam chowder. Nonetheless, you can add spices as you prepare it if you like it spicy. It comes in a clear microwaveable container and It tastes so good. There are people who say that this tastes very close to Campbell Manhattan. I would disagree but its so good for anyone who loves the chunky soup version. For me, it’s the best of Aldi brand because it not only warms my cold days but also gives me the desirable taste. Its also filling and doesn’t make you tired and sluggish for the rest of your day. It contains a lot of clams and hearty potatoes. Since it’s ready to serve, I never miss it in my refrigerator for those cold days. Besides, Aldi has the best deals when it comes to canned foods. Like any other item you are considering to buy, this one has a criterion that will lead you right to the best one in the market. Canned products tend to contain lots of sodium. No wonder, not many people trust them. However, a lot of sodium is unhealthy. It’s linked to diseases like heart diseases and diabetes. The sodium is used to hide the after-taste of the meal but when used in excess it becomes hazardous. When choosing the clam chowder, go for one with less sodium. You may use a pinch of salt to flavor it if you need to. Understand that condensed soup will require you to prepare it. It has the water content drained from the soup mixture to give it a longer shelf life. When preparing it, you will need to empty your can in a saucepan and then add water. The condensed version is your best choice when you wish to use the chowder for more days as opposed to one sitting. The version has a longer shelf life. Your ready to serve choice is just that ready to serve. You can’t keep it for long and it doesn’t call for much work as you simply pop it out of the can and eat. Alternatively, you can heat it and note that it has lesser servings. Nevertheless, it’s a convenient choice if you are looking for a quick solution. I don’t know what you are after when you choose any kind of soup but my favorite one is new England. Note that, this two differ in appearance texture and flavor. Do you know the white bechamel sauce that is used when prepping lasagne or pasta? The New England has a similar color. This is normally from the cream base of the soup. The cream is thick and it’s what makes it a New England clam chowder. The chowder further contains butter and flour which is never used in Manhattan or other Manhattan like chowders. On the other hand, Manhattan clam chowder is a red tomato-based soup that contains different kinds of veggies. Moreover, its spicier than the New England version above. It has an enhanced chunky texture that results from the tomatoes and chunks of other veggies. What if you want a healthier choice? It’s perceptual that canned dishes are never the healthier choices. Most would prefer homemade food. Nevertheless, there will be healthier versions of this canned clam chowder. Choose the gluten-free brands that contain low to no fat. Such kinds will contain lesser saturated fats making them the healthier options. Also, choose the clam chowders with less sodium. This is especially essential for those who suffer from oedema, diabetes, high blood pressure among other illnesses. Remember, you might have to spice this choice as the taste of the soup is bland. I don’t know of you, but I prefer my soup with protein as it gives it more flavor. Some companies will use more potatoes than the clam making it a completely different meal. I always say that you don’t need to eat a potato soup assuming its clam chowder. Go for options with a generous serving of clams. Have you ever considered making the soup at home? At the beginning of the article, we mentioned that making the soup is a bit technical. Some would think they can just use the instant pot but that works for most other soups and not chowder. The problem with clam chowder is that you mustn’t overcook it. I have tried making it but it never comes out as the ones I eat in the restaurants. This will require us to know your personal preference. Another thing to know is the kind of chowder you are making because only then will you tell the spices and herbs that suit it. You see, New England doesn’t require much spicing while Manhattan version would use spices. Nonetheless, you can use red pepper flakes, cayenne pepper, ground mustard and paprika for these chowders. Worry not about the heat because the paprika and ground mustard will compliment each other in a way that works well for your potato and cheesy chowders. For seasoning, it’s best to add a pinch of salt and pepper if you like it hot. You can also use the Chesapeake/old bay seasoning for a robust of flavor. Also, you could add some fresh parsley, oregano, thyme and basil. Use the cornstarch since it’s gluten-free and quick thickener. You can also use the arrowroot thickener which works best if you plan to freeze some of your leftover soups. You can also use potato starch as it is a rapid thickener than the cornstarch. Besides, it doesn’t live your soup cloudy. Using the canned clam chowder, dried thyme, bacon slices and ground black pepper, you can make a hearty clam chowder. You won’t even know that you bought the canned chowder. Place the soup in your saucepan. Add the salt, pepper and thymes. Stir all of them together and simmer for about 20 minutes. Place In your soup bowls and add the slices of bacon then serve. Use all the above-mentioned ingredients. Then add celery, onion, milk or cream, old bay leaves or parsley and butter. Using a stove pot, heat your oil in the saucepan. Add your chopped onions and celery and let it cook for about 3 minutes. Add in the soup, clam, milk bacon and cook under medium heat for about 6 minutes. Serve in the soup bowls and garnish with old bay and parsley. Remove the chowder from the refrigerator and place it in a saucepan. Simmer it over medium heat as you stir. If you need to thicken it add the thickeners before you begin to simmer it. Remove the lid and place the soup in a microwave safe container then cover with a paper towel. Heat it for about 3 minutes over high heat then stir it. Reheat again and garnish with parsley before you begin eating. While most people believe canned food should be avoided, there are healthy options of clam chowder that you can make better as discussed above. I know the list of chowder can really confuse. Now, it’s not good to give you my opinion because our taste buds are different. 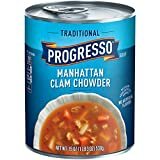 However, I would choose the Progresso Soup, Rich & Hearty, New England Clam Chowder Soup anytime. It’s healthy and richly flavored. 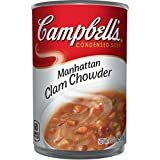 I never use Manhattan chowder as much but I must say the one time I tried Campbell’s Condensed Manhattan Clam Chowder was good. I would like to know how to enhance the flavor of my homemade Manhattan Clam Chowder, as it does not have a very clam like taste to it. 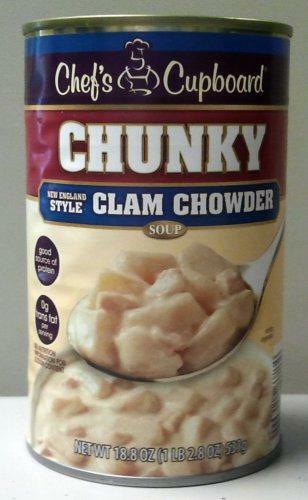 I used 4 (4.5 ounce) cans of minced clams and 2 (8 ounce) bottles of clam chowder. What can I add to add more clam flavor. I used a recipe for 8 servings on the internet. Can adding canned clam chowder bring a better clam taste to the soup?